Family time, traditions to savor, cultural gatherings that awaken your senses, athletic showdowns and, of course, all things celebrating music are on the Austin docket for 2014. 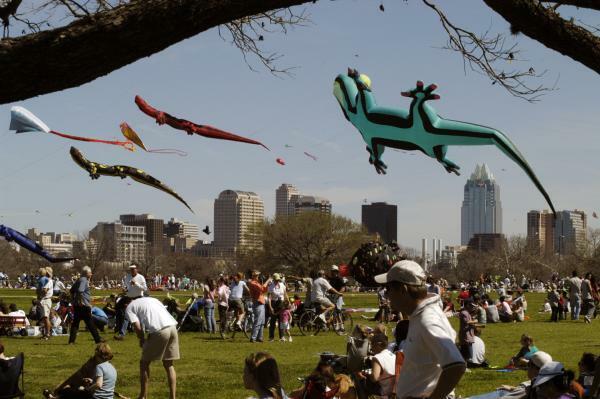 Here are our top picks for must-attend Austin events in the new year. The outdoor festival celebrates Dr. Martin Luther King, Jr. with performances by some of the city&apos;s finest jazz, blues and gospel musicians. Flamboyant costumes, Brazilian samba music, and the uninhibited, spirited atmosphere make Austin&apos;s Carnaval one of the biggest such festivals outside of Brazil. One of the country&apos;s premier races attracts nearly 20,000 participants from around the world. Austin goes cowboy as PCRA competitors hit the arena and area-students exhibit prize livestock. Headline entertainers perform in concert nightly. Over 300,000 attendees, filmmakers, musicians and multimedia artists from around the world converge to showcase music, film and interactive media during this internationally-recognized event. Moontower Comedy and Oddity Festival presented by the Paramount Theatre brings to Austin some of the funniest, wittiest and oddest world-class comics from around the globe. This marathon of side-splitting nights throughout the city is slated to bring over 100 comedians doing everything from stand-up and sketch to improv and musical comedy. National headliners, up-and-comers and local Austin-based comedians ensure that there are options for every type of comedy fan; die-hards to those just looking for a fun night. Pamper your palate in one of the hippest cities in the country at the Austin FOOD & WINE Festival, presented byFOOD & WINE Magazine. Join top chef talent, sommeliers and winemakers from across the nation and Austin&apos;s own acclaimed gourmet scene for an indulgent, two-day epicurean adventure unlike any other, topped off with live musical performances. Austin, Texas, the Live Music Capital of the World, has been selected to host one of six stops on the Global X Games circuit for the next four years. Austin was chosen from a pool of four finalists and will replace longtime host Los Angeles. Celebrate this batty event as the world&apos;s largest bat colony (anywhere between 75,000-1.5 million Mexican Free Tail Bats which take up seasonal residence beneath the Ann Richard&apos;s Congress Street Bridge) take to the skies for their nightly flight feasting on insects. Enjoy live music, children&apos;s activities and costume contests. One of the country&apos;s largest celebrations of music, this six-day festival brings the magic of the famed public TV series Austin City Limits outside the studio and into Austin&apos;s most beloved park with more than 130 musical acts on 8 stages. One of the most relaxed, creative, and pioneering festivals in music today, Fun Fun Fun Fest is custom booked for the most passionate, underground, and progressive musicians, comedians and fans around the world. Drivers will be in Austin competing in the Formula 1 United States Grand Prix in November. Built around a state-of-the-art 3.4-mile circuit track with capacity for 120,000 fans and an elevation change of 133 feet, the facility is designed for any and all classes of racing - from motor power to human power.